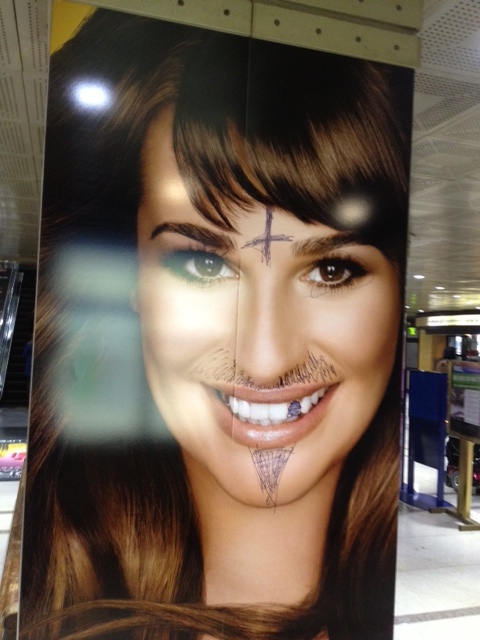 It looks like someone has brazenly defaced one of the ads in Union Station. Is nothing sacred? So, ShesAllWrite and I do this thing, where one of us picks an ad, and we both discuss it. It’s called Adsussing. You know. Sussing! Of ads! 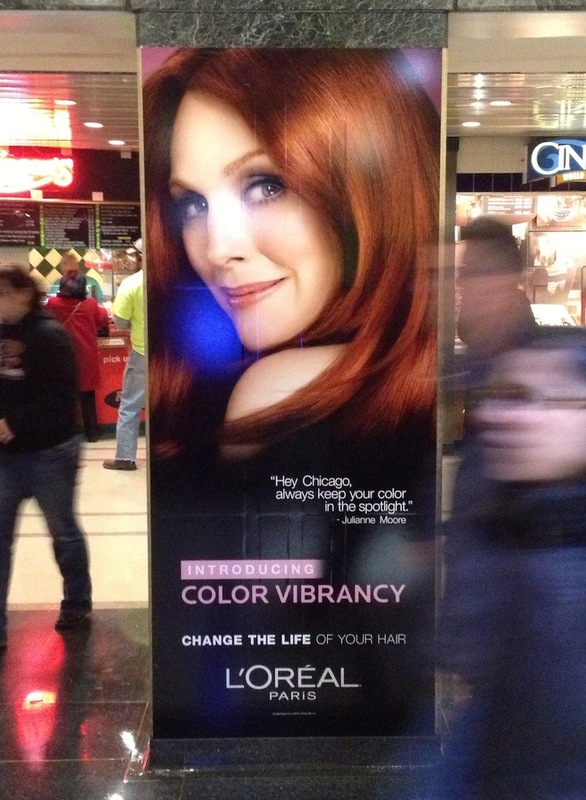 Anywho, here’s our topic for this post — an ad featuring Julianne Moore in Chicago’s Union Station. Hello, Julianne Moore. You have nice hair. I’ll grant you that. Why are you addressing Chicago? And when you address Chicago, do you really say, “Hey Chicago”? That’s kind of rude, Julianne Moore. I’m used to seeing celebrities endorse products, but I find it very unusual that this ad purports to actually quote the celebrity endorser. It’s just plain weird. So, did Julianne Moore REALLY say this? Does Julianne Moore know she is being quoted by a French beauty company? I presume she knows her image is being used to sell “Color Vibrancy”. But does she know they are using some possibly-made-up quote of hers in their ad campaign? I want some sort of verification that she said this quote. Otherwise it’s a filthy lie, and I want nothing to do with these wonderful hair care products. My hair has a life? Why didn’t anyone tell me? 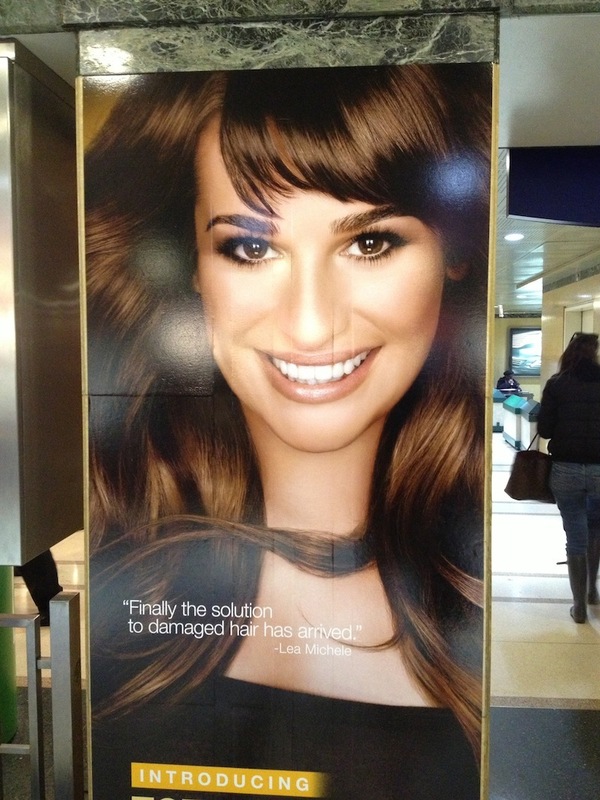 Not surprisingly, this ad for hair color is painfully superficial. When I think about life-changing things, my hair never enters the picture. I get that keeping her appearance up can make a woman feel great, but L’oreal is trying to suggest that it will make her feel great to the tune of changing her life. How can you change your hair’s life without changing your own? Your hair follows you everywhere! I think an ad like this is effective on 99.9% of people. Lives, like processed hair, become dull. Who wouldn’t want to believe that a $10 box of color holds the key to a brilliant transformation? Me and the rest of the realists, that’s who. It’s not that I don’t color my hair, I do–I have a few grey strands I’m not ready to rock yet. But I don’t ever pretend dying my hair will change anything other than the color of my hair. I actually find it to be a tedious chore–even when someone else does it. There are a million things I’d rather do than sit with a wad of dye on my head. If L’oreal wanted to advertise to people like me, this ad would look much different. It would call out how easy it is to use, how quick the processing time is and how little it smells. But L’oreal doesn’t care about the exceptions to the rules. They want to talk to the masses, and the masses believe in quick, easy fixes to all of life’s problems. One other thing that bugs me about this ad is that Julianne Moore is airbrushed to Bejesus and back. She’s 52 years old, and this photo of her has been enhanced to make her look like she’s in her early 20s. This sets unrealistic expectations on everyone’s part, and women lose big time. Men will always be able to find (and possibly date) women in their early 20s, but women can’t get younger. I wish female celebrities would grow a pair of ovaries and show us what they really look like as they age. There’s no shame in aging, but you’d never know it by the advertising industry. I am not so disappointed with Moore that she was airbrushed to hell and back, in that it’s the industry that creates these unrealistic images of women via all sorts of image manipulation. Wait, let me back up. Okay, she herself is taking the money for these ads, and unlike other ads (bottled water! a truck! microwave burritos! ), selling beauty products while at the same time having every blemish digitally corrected does kind of make her a little responsible for these hokey standards of beauty being pushed. Sheesh, I wasn’t even sure what this stupid ad was for. So it’s for hair coloring? I guess I focused so much on the stupid quote I didn’t get the ad’s stupid point. And I didn’t even notice that “CHANGE THE LIFE” line. I hope whoever thought of the “[BOLD! ]CHANGE THE LIFE[/ENDBOLD!] OF YOUR HAIR” ad copy gets a case of mild diarrhea. 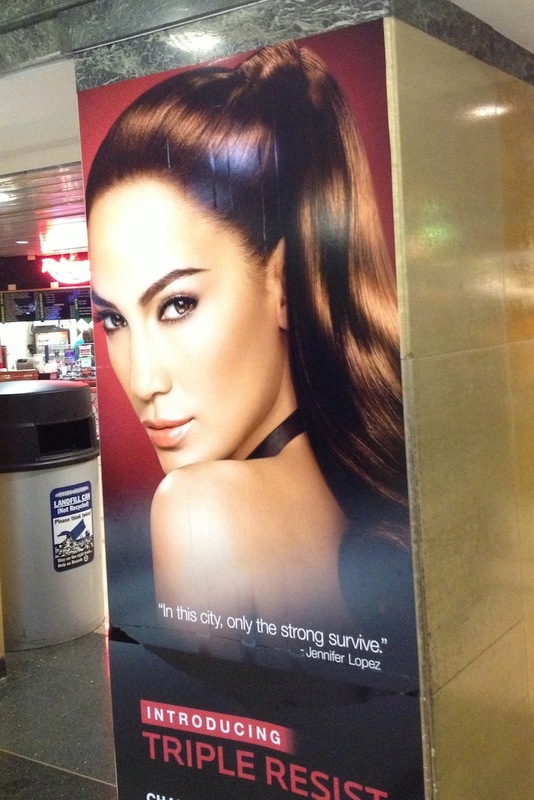 I neglected to mention that there were other celebrity women in this ad campaign at Union Station. They each had quotes attributed to them, but none of the quotes were Chicago-specific like Moore’s. Whoops! 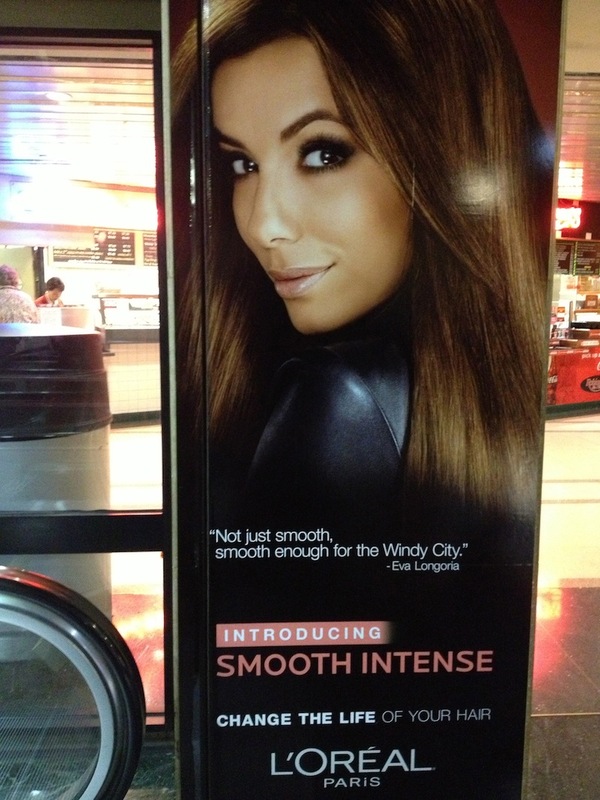 Now that I have looked at them, Eva Longoria totally has our number as a Windy City. Bravo, Ms. Longoria! Now that I’ve seen a few more of these ads in Union Station, I see that they are not for hair color, but for hair care products (shampoos, conditioners, styling aids) for a vast array of hair types. The fact that I couldn’t immediately discern this from the photo of the first ad Michael sent me is the worst thing about this ad campaign. With any form of display advertising, a brand has 3-5 seconds to tell the consumer what their product or service is, what it will do for them and how it will do this thing better than any other similar product or service. L’oreal failed big time on this front. Another fail is that there are too many varieties of L’oreal hair products in this campaign–the value proposition messages are too scattered. L’oreal would have been better off focusing the campaign on one product type, or collection from this line–the color-protecting collection, for instance. There are too many calls to action in this campaign, and the ads don’t communicate clearly or concisely, so as a consumer, I have no idea which of these products I am supposed to want or why. I give this campaign a solid F.
Hey look, it’s a tattoo that looks alarmingly like pubic hair. Thanks, Facebook! 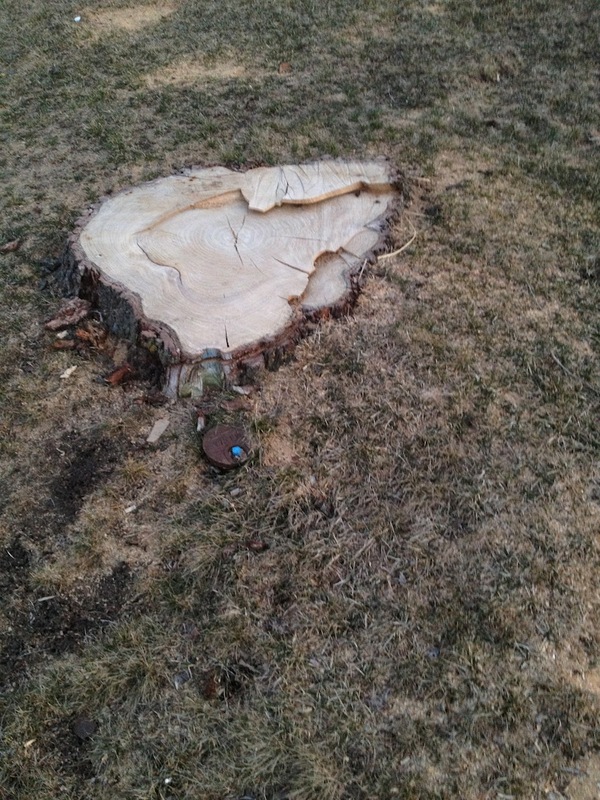 There was a tree here, and now it’s gone.